This is a small venture into C4D’s Python scripting (once again, to see ‘how stuff works’). 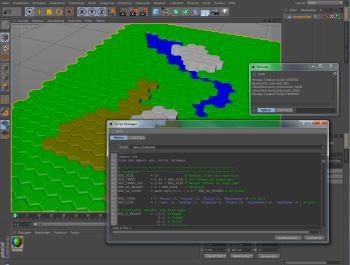 The provided script will read in a hex map definition file, saved from my ‘HexMapCreator’ application and create an UV-mapped hex map object (and text info file) from it. 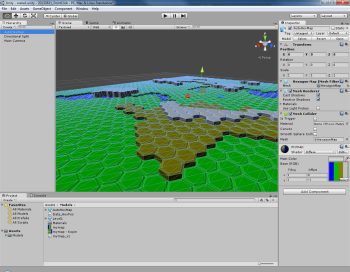 Place files ‘mymap.bmp’ (color bitmap for texturing) and ‘mymap_xz.txt’ (export from HexMapCreator) in a test folder (both files are needed for map object creation). Although all this is rather tailored to my very personal needs, you might want to check the script and see if you could use parts of it for your own purposes. Note that I have chosen to create ’embossed’ tiles, which rises number of created polys.